The motion picture Salt of the Earth was a groundbreaking film when it first came out in 1954. It was one of the first pictures to deal with the feminist social and political point of view. It was also one of the first to show Mexican Americans standing up for their rights and against discrimination. Unfortunately, it was not viewed by many at the time as it was the only film to be virtually banned from being shown in the United States. 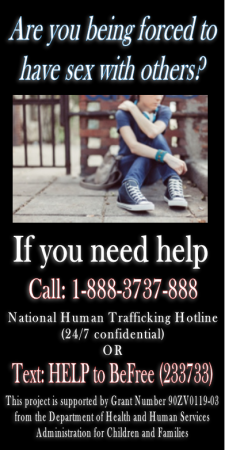 Only 12 theaters in the entire country had the courage to show the film. Marianna Quevedo Verdugo, a resident of the Copper Corridor, has a personal connection to the movie Salt of the Earth and even a small speaking part. The U.S. government and the powers in Hollywood conspired to prevent it from being made and shown. It was the McCarthy era and the House of Un-American Activities Committee (HUAC) was going after alleged communists both real and imagined including liberal minded Americans involved in the Civil Rights Movement, union officials, and homosexuals. Anyone with political views considered radical stood the risk of being investigated and/or branded a communist. This included Hollywood liberals. Anti-Semitism was also involved in the actions of HUAC. 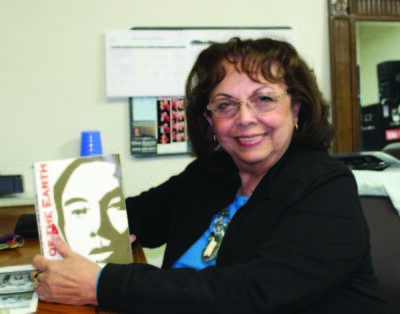 Marianna Quevedo Verdugo grew up in southwestern mining towns. Like many mining families her family experienced the hardships that miners endure such as layoffs, strikes, moving in search of work and dangerous working conditions. Both of her grandfathers were killed in mining accidents. Her grandfather on her father’s side died in Mogollon, New Mexico. Her mother’s father died while working in another mine in New Mexico. In the 1950s and ‘60s the Mexican-American and Mexican miners also faced discrimination and segregation in housing by the mining companies. 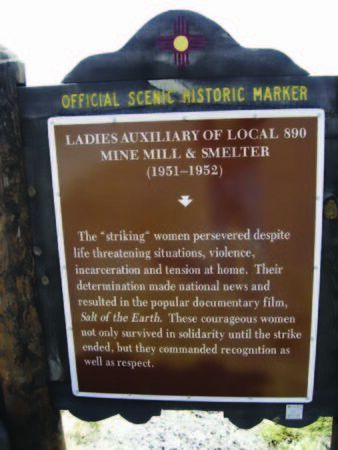 This historical marker in New Mexico commemorates the striking women for the Mill Workers 590 Union. Marianna’s family experienced some of that discrimination. At the time, her family was living in the town of Central, New Mexico which is now known as Santa Clara. 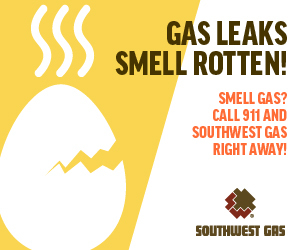 There were a couple of mines in the area with the surrounding towns of Hurley, Bayard, Silver City and Hanover located nearby. She remembers that her family would travel to Hurley to go to the movies. The theater had separate seating for whites and Mexicans. The Mexicans and other minorities would have to sit in the balcony in the back of the theater. Marianna, as a child was so naïve, she thought they were segregated because they were union families. Her father, Tony Quevedo, also got into trouble for speaking out against discrimination at the mine where he worked in Hurley. He told her the story of coming across a want ad in the local newspaper advertising a position opening at the mine which advised that “whites only need apply.” Her dad posted it on the mine bulletin board. A white employee of German heritage confronted him about his complaints of discrimination and told him maybe he ought to go back to his country. Tony was a World War II veteran and informed him that he was born in this country and had fought for it in Europe, which silenced the man. 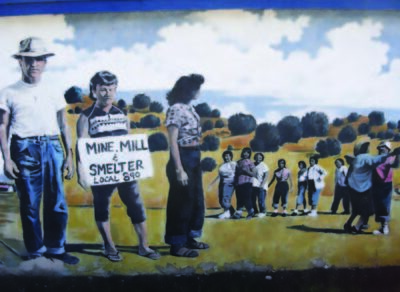 This mural shows the range of picketers during the Empire Zinc Mine Strike in New Mexico. During the Empire Zinc Mine strike, her father was working at the Asarco mine in Hurley, New Mexico. Some of the miners involved in the strike lived in Central and were known by her family. Her father was a union member and was aware of the strike. When a judge imposed an injunction against the Mine Mill Local 890 preventing the men from picketing at the Empire Zinc mine site, the wives and female family members of the miners decided to “woman” the picket lines. Marianna’s mother, Esperanza knew some of the union wives and when asked, volunteered to help picket as well. She also brought her daughters, Marianna and Mary Ellen, to the mine site with her. The two sisters, their mother and grandmother Regina, walked the picket lines at the Empire Zinc mine. One of her uncles worked at the zinc mine and had walked the picket before the injunction. Marianna was five or six years old at the time but has little memory of the strike. She remembers the women would dance and laugh all day long while walking the picket line. She also remembers the incident where someone drove a vehicle into the picket line running over and injuring some of the women. 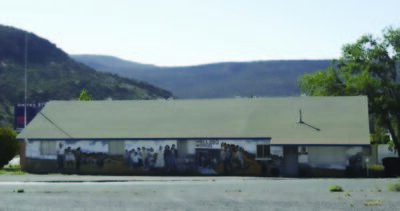 One year after the Empire Zinc Mine strike, a motion picture company came to Silver City to make a film which would be a fictional account of the strike. The director of the film, Herbert Biberman decided to make the film using many of the Mexican-American miners and their families who had been involved in the actual strike and other mining families from the area. Bieberman was one of the “Hollywood Ten” a group of Hollywood liberals who had stood up to Congress and refused to answer the question “Are you now or have you ever been a member of the Communist Party?” Biberman and the Hollywood Ten were sentenced to one year in prison for contempt of Congress. They would all be blacklisted and unable to work in Hollywood. After serving six months in a federal prison, Biberman was released. Unable to obtain work in Hollywood, he and some other blacklisted Hollywood professionals decided to set up a production company and make their own film which turned out to be Salt of the Earth. The professionals were Producer, Paul Jarrico and Academy Award winning screen writer Michael Wilson. Blacklisted actor Will Geer (Grandpa Walton) would join the cast as one of only five professional actors used in the film. Clinton Jencks, a union organizer for Mine Mill, appeared in the film as did the President of the local Mine Mill Union, Juan Chacon. A call went out in the area for extras to appear in the movie. Marianna’s mother and grandmother appeared in the film along with Marianna who had a small speaking part. Marianna appeared in a jail scene. During the Empire Mine Zinc strike, women on the picket lines and their kids were thrown in jail by the local Sheriff. In the re-created fictional scene, Marianna said she was given a tin cup and told to bang it on the bars while saying “we want the formula.” In the movie one of the women had an infant that was hungry and the Sheriff would not provide any formula for the child. Marianna’s family moved from New Mexico to Arizona where her father found work in the copper mines. They first moved to Superior then Miami and Mammoth before moving to San Manuel where her dad worked for Magma Copper. He worked for Magma Copper for over 30 years before retiring. Marianna graduated from San Manuel High School. She said that she had forgotten about Salt of the Earth and wasn’t aware that it was a movie until a friend of hers, Delberto “Del” Ruiz, called her one day and asked her if she knew anything about the film and the Empire Zinc Mine strike. Delberto was from Mammoth but was attending the University of California at Berkley at the time. He told her about the movie and that it was required viewing for the Chicano Studies program at Berkley. It was then that memories came back to her and they were confirmed by her mom and dad. She has since seen the movie although she said it was a very grainy copy. Marianna believes that the story of Salt of the Earth is still relevant today with the political climate change after the Presidential election. The attacks on the news media, anti-union, anti-immigrant rhetoric is reminiscent of the McCarthy era. It was more than just a movie to her and her family.